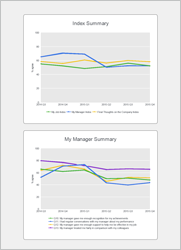 When reporting surveys over multiple time periods, this report shows the trend of each question in each Summary as a value over time in a chart. Useful for seeing if any question in a summary behaves differently from the others over time. Word outputs are formatted as two charts per page. Excel outputs have all charts on a single tab. Web reports are continuous. PowerPoint and PNG formats are single chart per page or image.